Our tea hamper recalls a quieter era when people took the time to savor life's everyday pleasures and made an art out of a simple cup of tea. The hamper contains three 4.4 ounce tins of premium loose tea (the selection varies, so be sure to inquire about the current blends we are featuring), a tea strainer, fruited honey, traditional Italian Biscotti, four sugar swizzle sticks and tea drops, a natural flavoring for tea used by the Shakers in the 19th Century. Available in regular and decaffeinated. We offer gourmet tea baskets, gourmet tea gifts, assorted tea baskets, tea and honey baskets, tea time baskets, tea hampers, and baskets of teas. 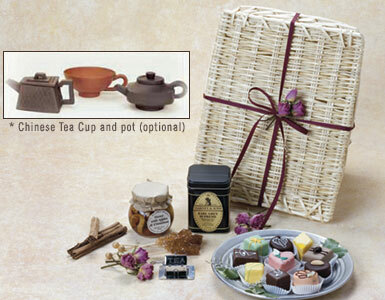 We guarantee prompt tea gift basket delivery in Beverly Hills, West Hollywood, Santa Monica and greater Los Angeles area.